There is a wonderful website, Yahoo Answers, where people can ask questions on a variety of topics and other people try to answer them. It’s an excellent reference source for all kinds of information. 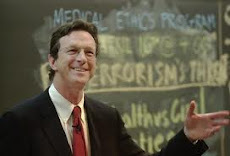 A few months ago I was surprised to discover that Michael Crichton had once participated on this website. Under his name is a green label reading “official” which means that Yahoo verified that he is the famous person of that name. He is listed as being a member since December 4, 2006, which was soon after the publication of Next. The user you've specified does not exist on Yahoo! Answers. You may have clicked on an invalid link, please try again later. Fortunately when I discovered Crichton’s profile, it was still active. He did not spend much time on Yahoo Answers but he did ask one question and answered three. What will be the biggest benefit for human beings from mapping the human genome? Most of the best answers talked about medical benefits from decoding the genome though even the most knowledgeable of you were rather vague about the benefits to come. That's understandable; at this point nobody knows where our research efforts will lead. Genetics has diagnostic potential but many scientists believe that in a few years proteins will prove to be more useful. The whole field is in flux. A number of you mentioned immortality. There has certainly been a lot of speculation about that, but many lines of research lead me to feel quite certain that immortality is not in our future. It's fun to think about, but don't hold your breath. I choose the answer from ZERO COOL because it focused on realistic outcomes, including rational drug design, early detection of genetic predisposition to disease, and custom drugs. And the author seems to have a firm grasp of exactly how we move from symptomatic treatment to addressing disorders at a fundamental level. How would one go about starting to write a novel? There is a famous answer to this. Put seat in chair. Keep it there eight hours a day. Face the paper or computer screen. Continue to work until something useful happens. There is another famous answer, to paraphrase John Cage: "Have something you want to say, and then say it." There is a third answer: there are no tricks. You just have to do it. It's rather like a construction project. Product placement in books. How can this work to enhance a story? I oppose this practice. I think when people are being exposed to adverts, they should know it. What talents do you need to be a best-selling author (apart from being able to write!)? Judging from the best seller lists, I am not sure writing ability is so important, frankly. As for necessary talents, remember what E.M. Forster said: "The story, oh my God the story." Storytelling is the most important skill. As for myself, I like to answer questions on Yahoo Answers, and I look for questions on Michael Crichton. Unfortunately many of them are from students who don’t want to actually read his books and are looking for someone to do their homework for them. I remember back in 2005 someone posted a message on the board of Crichton’s official website asking for a list of all the differences between the Jurassic Park book and the film version. This sounds suspiciously like you want help doing a school project or homework, which we don't do here. Michael is a big believer in doing your own work. If you didn't plan enough time to do the proper research, then talk to your teacher and have him help you learn better time/management skills…There is a BIG difference between asking for clarification on a point or two (which is fine) -- after you've done the leg work -- and asking for a full term paper (which is not fine). “One event from each chapter in Michael Crichton "the Andromeda strain"? I have a question about The Great Train Robbery, by Michael Crichton? I read the book at the beginning of summer, but I left it at home, and now I have to write a report on it. Could someone please tell me the name of the young lady Edward Pierce was courting in order to get the key from her father? If you could, it would be a great help! Thank you!!!! Now this is a question from someone who has clearly read the book, and I was happy to answer it. 78 days until the release of Pirate Latitudes! Great post, but I have one question (hopefully not bad) - about whom is Crichton talking mentioning "John Cage"?